The Fair Tax -- An Essential Element for Jobs! Let's get rid of the IRS. Who would not like that? "The Congress shall have power to lay and collect taxes on incomes, from whatever source derived, without apportionment among the several States, and without regard to any census or enumeration." Way back in February, 1913, the 16th Amendment was ratified by the states and thus it became a part of the Constitution. As such, mostly everybody who is affected by income tax would like it to go away. Even Congress cannot summarily get rid of it. It will take another amendment to the constitution to make that happen and that is not easy. But, if I am elected your Senator, you can be assured I will push to get the ball rolling as well as the implementation of most parts of the elements of the FAIR tax as well as the reduction in the corporate income tax as discussed in other essays. America ought to have the lowest corporate income tax so that we can invite companies from across the world to build their plants in America. Americans are OK working in good jobs for companies that like to hire Americans. All of this fits in with the notion of the Fair Tax. Freeing corporations of their tax burden so they will produce more in the US is a big part of the Fair Tax. Additionally, since all real Americans are for Americans first, any so-called American corporation that has taken its jobs overseas, must be held in less regard than foreign corporations hiring Americans for work in America. Perhaps these corporations may be fictitious citizens under the law but if they are not for America and for Americans, not only can we wish they go away, we can actually help take them out. But, let's not go there just yet! I would propose that all of the various TEA Partys-- groups of citizens dedicated to America, should combine for informational purposes while maintaining their own independence. There should be just one TEA Party central news conduit to avoid confusion. No TEA party arguments v. other TEA party arguments should whould be entertained on the information site, However, consensus TEA Party conclusions should be published. The people should find a unifying call to action from their closest TEA Party site. Nobody is perfect and so, all TEA Party factions should be permitted to debate their notions behind closed doors, subject to publication. My opinion of course is that the least conservative notions lose the floor. But, the people of the US-- all the defacto members of the TEA Party should be able to debate their notions again and again, before the unifying caucus takes a vote and determines what the people, who are not in the hierarchy should know, and more importantly, what they should do in the face of extreme adversity. The information I think would serve America most is for the TEA Party to identify those corporations that have shown disdain for American workers. Those who have moved their jobs overseas would be at the top of my list. Dear TEA Party, if you have it within your means, please tell US who all of these corporate rogues actually are. I have not quite determined how aggressively we should strike against a non-American mentality in the corporate sphere. Yet, as I look at the evidence, I have a tough time being sympathetic to corporations regarding the loss of corporate jobs. I don't want to use the word "boycott" as it has more intensity than I am ready to admit. But, the facts indicate that the people have suffered more than they should have suffered mostly because of corporate indifference to the plight of Americans. These sentiments are at such a high level of intensity that it is tough to overcome. Whether corporations are the perpetrators in this the 2011 jobs debacle, only historians will know. However, it is very clear that corporations have not been kind to Americans while Americans have been suffering. So, if you will pardon my frankness, I am not really concerned about being kind to American corporations. "Do unto others as you would have them do unto you." When a corporation is not held in high regard, the notion of being in less regard should not be pleasant for any so-called American firm identified as selfish, greedy, and anti-American. So, the TEA party can not only help us at election time, it can serve as a consumer reports of sorts on corporations. Those good to Americans will be exalted, and those unkind to Americans will be identified and redlined. Jobs is the Big Problem! The problem of the day in 2011 / 2012 continues to be Jobs! Jobs! Jobs! It's been bad since 2008 with the first Democratically controlled Pelosi-led Congress and it is getting worse as time goes by. In December, 2005, before the 111th Democratically controlled Congress was sworn in, the unemployment rate was 4.6% for the year and 4.5% for the month. Immediately after being sworn-in, the 111th Congress, the most corrupt of all time, enacted legislation that killed the economy and before they were done, we experienced the banking crisis in 2008, and the first of the stimulus (porkulus) bills, a solution that became a big problem. Unfortunately, when President Obama got his hands on all that money, it became his "stash." The dollars became targeted only for businesses who were big campaign donors, regardless of whether there was a positive impact for the country. If there was the chance of a positive campaign cash flow again this campaign season, that business got Obama's ear. The notion of shovel ready jobs became a joke within the Obama Administration so they spent the $trillion dollar stimulus like campaign funds. So, if you are wondering if a single job came out of all that corruption, the answer is a definite maybe. However, there are no maybes about how it set the deficit and the debt back by over a trillion dollars. And, if there were a job created, nobody can find it today. Yes, that was a diversion. So, now, you should be asking for me to please tell you how the 16th amendment helps business? How does the 16th amendment help Jobs? How does the Sixteenth amendment help you and me and the next guy assure that tomorrow will be a better day than today? Obviously it does not, or this essay would never have had to be written. The 16th Amendment to the Constitution authorizes the "progressive" income tax. We all know that is more than just a mechanism to feed the government's need to defend us, and to enable highways to be built and other things that individuals cannot do by themselves. We know that the 16th amendment as manifested by the income tax and the IRS has more recently been used as a mechanism for wealth redistribution. This is what killed the goose that laid golden eggs for a long time. America's "G-squad" geese have flown to China. These golden babies are helping the Chinese take over the world because we did not know how to take care of them. The income tax was not really a new notion in 1913. It had been used to fund the armies of the north in the Civil War. No country can conduct war without cash. So, to bring in a lot of revenue as necessary in 1861, Congress introduced the Revenue Act of 1861 with a flat tax of 3% on annual income above $800. Americans in the North, hoping to buy a solution to the problem of secession, paid the tax willingly. What a shame that American blood took American blood. May it never again happen in these United States, but the secret to assuring that is less, not more federal control. So, back to the income tax. The Civil War income tax self destructed in 1866 but was almost brought back a number of times by the Socialist Labor Party, one time in 1887, then the Populist Party gave it a try in 1892. The Democratic Party made its attempts in both 1894 and then again in 1908. Notice the Republicans were never openly for the personal income tax. Moreover, for Pennsylvanians, it is nice to know that along with Virginia and Florida, Pennsylvania never took up the proposed amendment that ultimately permits government to do things never intended by the Founding Patriots. The Income tax is unconstitutional and it breeds a huge government unaccountable to the people, which is also unconstitutional. It's time for this monster to go. Box it up and ship it home with 435 members of the House and 33% of the Senate in 2012. Unless, of course, they take the pledge on this site. On the US Treasury site, by the way, it states that, "By 1913, 36 States had ratified the 16th Amendment to the Constitution. In October, 1913, Congress passed a new income tax law with rates beginning at 1 percent and rising to 7 percent for taxpayers with income in excess of $500,000. Less than 1 percent of the population paid income tax at the time. Form 1040 was introduced as the standard tax reporting form and, though changed in many ways over the years, it remains in use today." However, few of us who use 1040, make over $500,000.00. Lawyers like to use the term slippery slope to mean "give them an inch and they will take a mile." The tax slope was so slippery that when John Kennedy cut back income taxes to save the economy in the early 1960's. the highest tax rate had crept all the way up to over 90%. That is highway robbery! No matter who you are, that is ridiculous. Whether my gross income ever goes above $100,000.00 or not, I do not deny those people clever enough to beat the business system to become utterly successful. Who are we to take away the gains of the hard working to pay for the sloth of the non-working? I want to see more people motivated to be rich, not less. No poor person was ever given a job by a poor person. Without these clever and industrius people, we would not have the radio, the TV, the computer or the ipod / ipad, and an awful lot of other wonderful things. Surely, the buffoons in the government would never have brought any of US such innovation, and so I question any person thinking we should turn to government for any of our needs other than National Defense, roads, and bridges. Putting this montrous federal government in charge of healthcare, for example, is like finding the worst player on the team when the championship game is tied in the bottom of the ninth. A stupid coach would pinch hit the best player, sending him to the dugout, and he would tell the worst player on the team to take his bat. You know with a coach like Obama, you're going to lose. it's a certitude. In America, until the Obama years, we played to win, and in so doing all Americans, sooner or later, would learn how to be winners. The 16th amendment like most things that may once have been OK, has been perverted over the years, especially by this administration. The Obama czars are ready to openly declare that an individual's wealth should be redistributed merely because government is all powerful. Working the plot of the Robin Hood movies, the government steals from the hard-working rich and give some alms to the poor, thereby making the poor dependent on the state. And, thus the poor are trained never to try to better themselves to perhaps become rich. In the newest trick with Obamacare, the government, in trying to equalize everything between the workers and non-workers have decided to redistribute healthcare. The last "person" in charge of anything should work for the government if you want things to work well. In the redistribution schemes, the workers somehow do not like them but the non-workers do. It is good to help the poor. That's why charity is a virtue. It is not good to help make people poor or poor-thinking. People, who otherwise would be fruitful contributors to their own lives, if convinced to stand and collect, may never try to work again. Dependency on government destroys hope. You can have faith in that. The notion of giving to those who should not need anything returns nothing to the people. The government really does decide too much. The income tax is used for social engineering. Government uses it as a tool to manage people's purchases via tax exemptions, credits, and deductions. Watch how much beer you drink; sugar you eat; and toilet paper you use because one of those video cameras that Uncle Sam is installing everywhere is going to tell on you one day soon. Is this what liberty and freedom are all about? People may ask, "How does a bureaucrat from the government know what is good or bad for you or for me?" We all know they do not because most of them are unfortunately asleep or too inept to make a positive difference. The last person anybody would call on, if in need would be a person from the government. Since we need taxes to support the good parts of government that we the people control, the best tax is clearly a consumption tax. We have discussed in the Fair Tax overview how we have seen waitresses and waiters that treat our families well. We know that they prefer to get cash, rather than have the tip on the bill because it is unreportable to the government. A consumption tax would get them and you and I only when we spend a dime. If they spend their tip, they would then pay a tax regardless of whether you gave them cash or it was on the charge card. So, a Fair Tax can save the money the government uses for the IRS to find the tips that these folks might hide. Though the drugs that a dealer sells may not get taxed, the drug dealer's purchases would all be subject to the FAIR TAX. The IRS can be eliminated with the Fair Tax because nobody will have to find the dollars that are earned under the table. Instead the tax will occur when the hidden loot is spent. 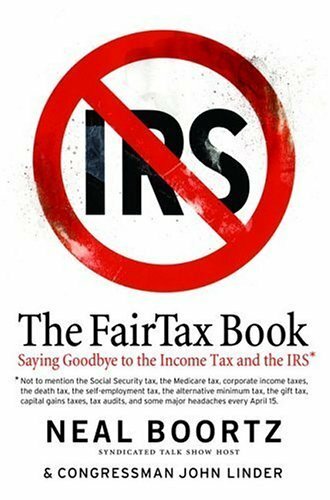 I personally would ask the IRS agents to stay on for quite awhile until we all got the FAIR TAX quirks ironed out. I would just stop sending them to our houses. So, a consumption / sales tax would force those operating outside the current income tax system to pay their fair share -- whether they are legal or illegal. In this way, nobody gets public services for free. Nobody! Why is that not something that we all like? Anybody with a job and those who receive money from those with a job all pay taxes. This lifts the burden from only those who work. Not a bad medicine for what ails us. Opponents of the Fair Tax love the idea of socialism and social engineering. The income tax is their finest tool. That is why the progressive solicalists love it so much. So, they will lie about the fairness of the Fair Tax. They will tell us that it will hurt Senior Citizens on Social Security. That is another lie that the socialist progressives like to tell. Has government ever lied to Seniors? Just all the time. Ask them about the CPI and the next increase in SS benefits! How about no COLA because the CPI (a.k.a. the inflation rate) is zero. Is that a joke? Seniors know that is a big and unforgivable lie perpetrated by Obama and this Congress and they are angry as hell about it. What Bureaucrats say about the Fair Tax is another pack of lies. We're hearing more and more about big cuts in Social Security and Medicare. Obamacare is a zillion times worse than any cuts, which, by the way, have not been announced. The only cuts on the table are not really cuts anyway. Paul Ryan in 2011 proposed a solution that everybody suggests is sane. Those who are 55 and older stay the same under the Ryan plan which saves Social Security. And, those 54 and younger will still also be OK with a program that assures something for them when they hit 65. Always keep in mind that it was the government that stole your Social Security trust fund and mine, in 1965, the Dems under Lyndon Johnson took the Social Security pie and used it to fund the Vietname War -- of budget. Though I am a Democrat, please know as far as Social Security and Medicare go, the Democrats are not on your side. They merely want to scare you so they will get reelected. Since nothing is law yet in 2011, hopefully, any the cuts will not affect those over 62 or anybody who is collecting already (propesed legislation says 55).So, if you are 54 or below, expect that the government will be telling you that you are no longer in the real Social Security fund. BTW, nobody has done this yet. From how reckless the Democrats have been since LBJ, I would not expect anything better than the Dems saying that your net contributions will be set to zero and you will be starting over. That is bull.... It is another way to scare you into vorting for them. I won't do that. Watch and see. Raises in Social Security may also be a thing of the past regardless of the inflation rate. The fact is the government is broke. I think it can be better than that, and though I am not a Republican, right now the Republican solutions make more sense to me than stealing from the pot until it is empty. There is another notion that a consumption tax can be a very practical measure by which we will gradually wean ourselves off of our dependence on federal and state services. By slowly lowering the percentage of the tax over time, the size of the government overall can shrink and government services can eventually be returned back to state control where they belong or perhaps, other than those deemed extremely essential, they can be ended entirely and people can keep their own money. How can that be bad. So that you understand the salient components of the Fair Tax Plan, I have captured from the http://www.fairtax.org/ site, some of its essence below. What is the Fair Tax Plan? The Fair Tax Plan is a comprehensive proposal that replaces all federal income and payroll based taxes with an integrated approach including a progressive national retail sales tax, a prebate to ensure no American pays federal taxes on spending up to the poverty level, dollar-for-dollar federal revenue neutrality, and, through companion legislation, the repeal of the 16th Amendment. That last notion, ladies and gentlemen means that Congress sets in motion the repeal of the 16th Amendment and with it goes the IRS. There actually has been an act proposed called the Fair Tax Act (HR 25, S 296). It is nonpartisan legislation. It abolishes all federal personal and corporate income taxes, gift, estate, capital gains, alternative minimum, Social Security, Medicare, and self-employment taxes and replaces them with one simple, visible, federal retail sales tax administered primarily by existing state sales tax authorities. Because the best approach would include either a very small corporate income tax in zero to 10% or less range and an offshoring penalty of perhaps another 10 to 20%, I support the basic tents of the Fair tax almost 100%. I would like to reserve jodgment on whether the corporate income tax should be used or abolished. I like the idea of having a tax for those who offshore jobs as an incentive to bring them home. I had thought that a ten percent corporate tax and a 10% progressive tax penalty for offshoring would be a good approach but I can probably be convinced that a zero corporate income tax with a 20% offshoring penalty might even be a better idea. I would also like to find a way to add a social cost penalty on corporations who pack up and leave unemployed workers behind. I am for Americans first. If corporations want to be good Americans, we'll see what we can do for them -- then! I would be happy to vote for the FAIR TAX as proposed just as it is but I would like a few tweaks to help American jobs. When I was oriignally considering how to improve the jobs picture, I was happy with a corporate because at 10%, it would be one of the lowest if not the lowest in the world. At a zero to 10% corporate level, this would create the opportunity for major investments in the US. If the FAIR Tax as proposed is enacted, I would introduce legislation to permit a 10 to 20% tax penalty for American corporations that offshore jobs. That would work fine for me. The Fair Tax taxes us only on what we choose to spend on new goods or services, not on what we earn. The Fair Tax is a fair, efficient, transparent, and intelligent solution to the frustration and inequity of our current tax system. To save you the effort of going out to the Fair tax site, http://www.fairtax.org/PDF/PlainEnglishSummary_TheFairTaxAct2007.pdf, I have copied the summary into this essay. If there is one thing one can say about the Fair Tax that cannot be said about the Income Tax, it is that it is Fair. "Effective January 1, 2009 [or whenever it goes into effect it replaces the above taxes with a national retail sales tax on all goods and services sold at retail. The tax rate is set to be revenue neutral – at the level necessary to replace the revenues generated by the repealed taxes. "A 23-percent (of the tax-inclusive sales price) sales tax is imposed on all retail sales for personal consumption of new goods and services. Exports and the purchase of inputs by businesses (i.e., intermediate sales) are not taxed, nor are used goods or any savings, investment, or education tuition expenses. The sales tax must be separately stated and charged on the sales receipt. This makes it clear to the consumer exactly how much they are paying in federal taxes. "There are no exemptions under the FairTax, meaning that no lobbyist, corporation, or individual can obtain tax advantages that are not available to the general public. Also, everyone pays the same rate, but those who spend more pay more total taxes than those who spend less. "The FairTax provides every American family with a rebate of the sales tax on spending up to the federal poverty level (plus an extra amount to prevent any marriage penalty). The rebate is paid monthly in advance. It allows a family of four to spend $27,380 tax free each year. The rebate for a married couple with two children is $525 per month ($6,297 annually). Therefore, no family pays federal sales tax on essential goods and services and middle-class families are effectively exempted on a large part of their annual spending. "Funding for Social Security and Medicare benefits remains the same. The Social Security and Medicare trust funds receive the same amount of money as they do under current law. The source of the trust fund revenue is a dedicated portion of sales tax revenue instead of payroll tax revenue. "States can elect to collect the federal sales tax on behalf of the federal government in exchange for a fee of one-quarter of one percent of gross collections. Retail businesses collecting the tax also get the same administrative fee. "Strong taxpayer rights provisions are incorporated into the Act. The burden of persuasion in disputes is on the government. A strong, independent problem resolution office is created. Taxpayers are entitled to professional fees in disputes unless the government establishes that its position was substantially justified." As the song ends, "Who could ask for anything more?"